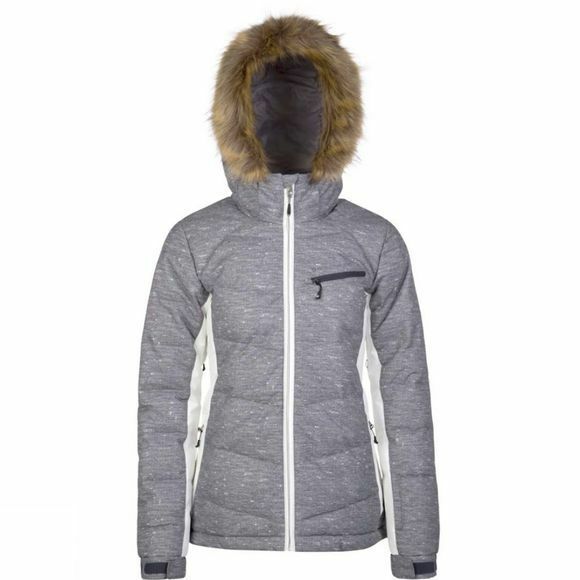 The Womens Peppe Jacket from Protest is your must-have ski jacket for the next cold snap. Featuring a fabulous printed herringbone design, there are panels of solid colour at the sides. As part of our Geotech series, this jacket has 10.000 mm water resistance, dispersing water away from the body while the outside surface is waterproof and windproof. There is a fantastic faux fur trim at the hood and both this trim and the hood itself can be removed if desired. The chest and side pockets are zippered in order to keep your essentials safe. There are also vent zippers at the arms for some natural cooling. The perfect ski jacket for your next winter adventure, the Peppe by Protest.